Ahoy-hoy, Inside Japan Centre readers! Is Halloween Celebrated in Japan? Yes it is! Although Halloween has only been celebrated in Japan for less than twenty years, it has quickly become one of their most joyously celebrated adopted Western holidays. 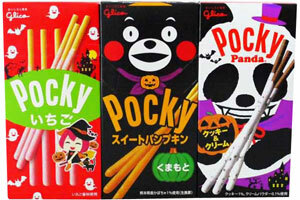 Every year many well known Japanese shop brands and food manufacturers release limited edition flavours and varieties of popular foods and drinks, and this year Glico have created a “Lovely Halloween” range of treats, now available to buy online. 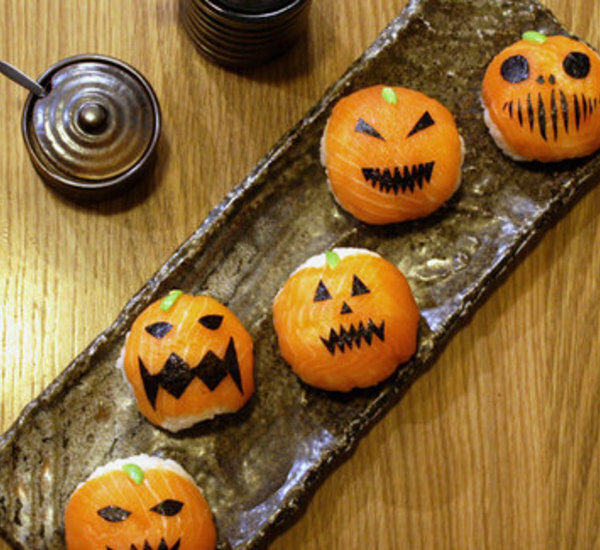 Read more about how Halloween is celebrated in Japan here. Alternatively, you could try your luck and win one of two Halloween tasters for yourself! What is in these Halloween Tasters? 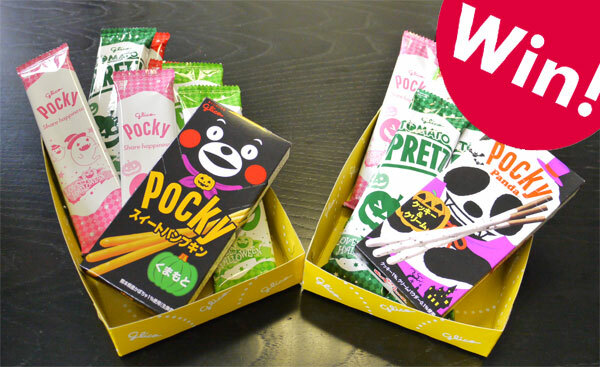 Each taster contains two single serve packets each of Halloween Chocolate Pocky, Halloween Strawberry Pocky, Halloween Salad Pretz and Halloween Tomato Pretz, as well as one box from our Halloween Variety Pocky. Our expert tasters at Japan Centre’s online hub can guarantee that these are some of the tastiest Pocky and Pretz we have ever eaten. Sounds Great! How do I Enter? 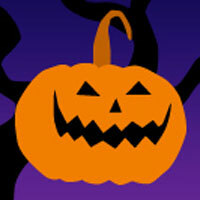 In order to be in with a chance to win, please send us an idea for a fantastic Halloween recipe. This can be any recipe, from a full dinner to a light snack to a bento box to a dessert. We would love it if you tried to make a recipe yourself, but this is not mandatory. You can send your entries either by leaving a comment on this post, or by posting on our Facebook or Twitter. We will be accepting entries for this competition until midnight on Tuesday 14th October, after which time the Japan Centre Online Hub will pick our two lucky winners and contact them by whichever medium you used to enter. If you have any other questions about this competition, feel free to contact us on here, on Facebook or on Twitter. All that is left for us to say is, Happy Creating! Posted in Uncategorized and tagged competition, halloween. Bookmark the permalink. I have a recipe and a bento if that’s OK with you guys! I developed my own recipe last year for these creepy slimy ectoplasm ghosts which taste absolutely gorgeous. I posted them here http://pepperbento.wordpress.com/2013/10/31/slimy-halloween-ectoplasm-ghosts-recipe/ but here’s the recipe! Place the jelly cubes in a bowl and pour over the boiling water. Microwave for 30 seconds, or until the cubes are dissolved. Pour in the evaporated milk and whisk until it is combined and is a uniform colour. Pour the mixture into the ice cube moulds and leave to set in the fridge for 2 hours. Pop the ghostly shapes from their moulds by pushing on the backs or by placing them in a bowl of shallow hot water for 30 seconds! I also made a bento last year, making an innocent bread roll into a scary skeleton head complete with a side serving of brains by cutting the roll into shape, scooping out some hollows for eyes and filling them with cream cheese and onion seeds then creating a mouth out of cheddar cheese and serving it with a cabbage salad coloured red for the brains! You can do an eyeball kanten. This will take a bit of time and 2 sizes of ice ball mould, but easy to do anyway. Take one blueberry, and drop it into blue kanten (I used blue curacao for the colour and flavour) that is set in a small round mould. After that is set, remove the “cornea”s, and set them into clear kanten (vanilla and sugar works best) in a large ice ball mould. My recipe is terrifyingly delicious! First you crack the jelly into small pieces in a bowl and add 3 dl of boiling water. Hereafter add 3 dl of cold water. Hereafter you pour the content into the glove and fold it well, put on the clothespins tightly. Then put the glove on a plate and leave it in the freezer the whole night. The next day you take it up, cut upen the glove with a scissor and look at your splendid jelly hand! Congratulations! You are one of the two winners of this fabulous competition! Please reply to this comment with an email address that we can use to contact you and arrange to have your lovely prize sent to you! Make icing to drizzle onto cakes or cupcakes by measuring out 1 1/4 cups confectioners’ sugar. Stir 3 tablespoons of milk into the confectioners’ sugar and, then, add 1/2 teaspoon vanilla extract. Use the icing to drizzle a spider web onto cakes or cupcakes. Scoop flesh from kiwis and blend with apple juice and maple syrup. Pour swamp mixture into glasses or bowls. Make eyeballs by splitting lychees in half and press a blueberry in centre. Place the eyeball in the swampy mixture. Squeeze pomegranate seeds to remove juice and pour a little over each eyeball. Break the Madeira cake and cookies into the bowl of a food processor, pour in the melted milk chocolate and whizz to combine. Tip the mixture into a bowl, then use your hands to roll into about 10 walnut-sized balls. Chill for 2 hrs until really firm. Push a skewer into each ball, then carefully spoon the white chocolate over the cake balls to completely cover. Stand the cake pops in the pumpkin, then press a Smartie onto the surface while wet. Chill again until the chocolate has set. Before serving, using the icing pens, add a pupil to each Smartie and wiggly red veins to the eyeballs. Roll up the sandwiches and make three indentations with a blunt knife to form the finger joints. Trim the ends of the fingers into a ‘V’ shape and stick an almond on to each tip with a little cream cheese to form the nails. Now for the yucky bit—add a dollop of strawberry jam over the end of the finger for the blood! What is Miso and What are the Different Types?